Robert J. Sampson is the Henry Ford II Professor of the Social Sciences at Harvard University, founding director of the Boston Area Research Initiative, and Affiliated Research Professor at the American Bar Foundation. He served as Chair of the Department of Sociology and taught at the University of Chicago before moving to Harvard. He also taught at the University of Illinois and was a Senior Research Fellow at the American Bar Foundation. Sampson was elected to the National Academy of Sciences in 2008 and is a Fellow of the American Academy of Arts and Sciences, the American Society of Criminology, the American Philosophical Society, and the American Academy of Political and Social Science. He served as President of the American Society of Criminology, and in 2011 he and his colleague John Laub received the Stockholm Prize in Criminology. In 2016, Sampson was elected as Corresponding Fellow of the British Academy, and in 2018 he was appointed as a Fellow of the John Simon Guggenheim Foundation. Professor Sampson's research and teaching cover a variety of areas including crime, disorder, the life course, neighborhood effects, civic engagement, inequality, "ecometrics," and the social structure of the city. He is the author of three award-winning books and numerous articles—see links to vita, articles, books, projects, data, classes, and interviews. His most recent book, published by the University of Chicago Press, is Great American City: Chicago and the Enduring Neighborhood Effect. 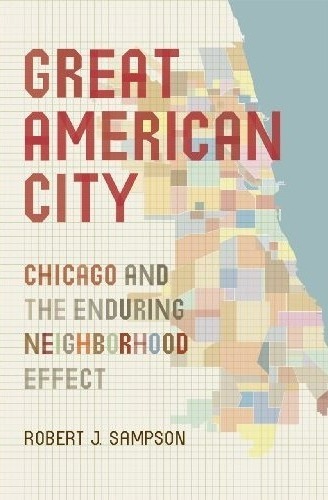 Great American City is based on the culmination of over a decade of research from the Project on Human Development in Chicago Neighborhoods (PHDCN), for which Sampson served as Scientific Director. For an intellectual biography see the National Academy of Sciences (2008).